Yes, it’s true. I went to prison 10 days ago — the Ohio State Reformatory, in Mansfield. You may be familiar with it if you’ve watched The Shawshank Redemption. Is anyone ever ready to confront themselves and scrutinize the self-limiting beliefs that have held them back for years? Is anyone ever ready to scrutinize the self-imposed constraints they’ve placed on what they will or won’t do in their lives? 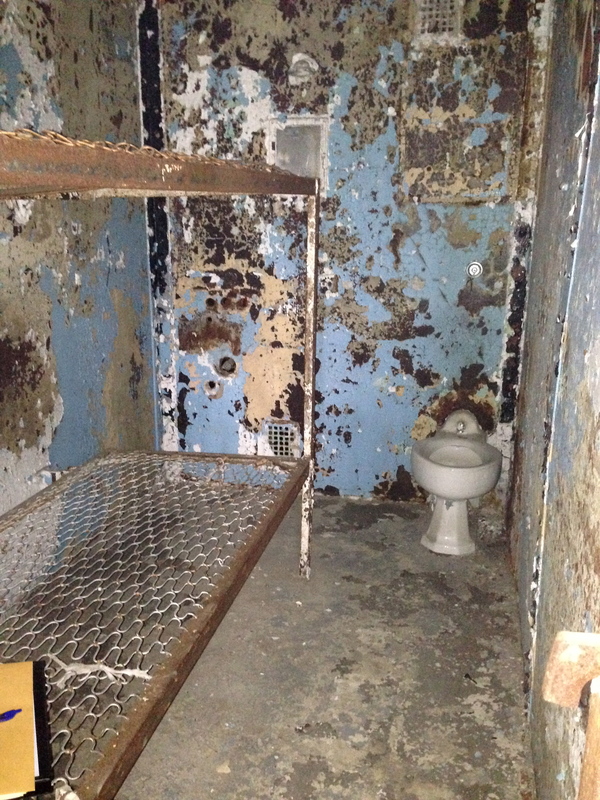 Is anyone ever ready to walk into a cold, dank, musty, rotting place, filled with the ghosts (I’m told they are real in this place, but cannot say I felt or saw any) of those who were literally locked behind those bars? The focus of the experience was to recognize our personal prisons, often realized through day jobs that fill our bank accounts (to some degree) while emptying our souls, and develop a plan for creating our dream jobs. I spent some time alone in a cell, laughing, crying, wondering, and reflecting on my life. Oddly, as I sat on the rusting springs of a “bed,” I could see muted light coming through the glass block windows across from my cell; I could hear birds singing. While in my cell, I wrote a good deal, in my journal, in response to some questions posed by one of my mentors/coaches who facilitated the experience, and in a letter to me from my future self. This letter will be mailed to me at some point in the next year; I will be absolutely surprised by what it says, as I have no memory of what I wrote! On the figurative side, I discovered much about myself. My prison is no longer a day job; although I consider myself blessed to have escaped from more than one that was not the place for me. What a blessing to fully understand one’s purpose in life! No, my prison is truly self-constructed, bars created from beliefs about who I am and how I show up in relationships and what those beliefs and behaviors mean for what I will experience and accomplish in my life. Self-awareness is the starting point for making any meaningful change in one’s life. Higher levels of awareness allow you to make choices, intentionally, with thought given to your desired outcomes. I’m working at a higher level of awareness now, and intentionally thinking and moving differently within the important relationships in my life. For now, at least, those particular prison bars have been erased. While it’s unlikely you will travel to, or spend any time in prison any time soon, I encourage you to spend some time with pen and paper in reflection. Consider what imprisons you. What’s keeping you from fully living into your passion and purpose? What small step can you take, with that new awareness, to change your reality? Tomorrow (28 January 2014) will be the last day I am able to offer this for FREE!!! Write yourself a reminder to stop by Amazon and download it. Get your free download of The ‘What Matters Most’ Manifesto! It will help you start down the path of creating more meaning in your life. Share it with friends, colleagues, and family! Then, please, take a minute and review it on Amazon! Remember: You don’t need to own a Kindle reader to get it. You simply need a Kindle Reader App, which will run on smart phones and tablets. Click here on 28 January for your copy! Did you fail at something in 2013? The honest answer for most of us is YES! The important question, however, is: Did you let that failure stop you? Regardless of your answer, I have something that will help you SOAR in 2014! On February 4th, I am beginning a 13-week in-depth study (Mastermind Group, or MMG) of John Maxwell’s Sometimes You Win, Sometimes You Learn. We will meet every Tuesday for 13 weeks, from 8-9 PM EST, via conference call (all calls will be recorded so you may listen to them, again). Every one of us has experienced loss, defeat, disappointment, mistakes, even slips in judgment, during our journey to greater success and higher levels of leadership. This MMG will focus on how we use those experiences as learning opportunities that can help us accelerate our future growth and progress towards our goals. We will study a variety of principles and concepts including: Humility, Reality, Responsibility, Teachability, Adversity, and much more. We will learn from each other’s experiences. We will develop a support network upon whom we can call as we work towards our 2014 goals. We will emerge from the experience better equipped to deal with the struggles, obstacles, and challenges we inevitably face as we strive to be, do, and have more in our lives. If you’re ready to invest in yourself and make 2014 the remarkable year it should be, don’t hesitate! Spots are limited and the MMG will fill up. The investment is $250 per person, or $475 if two register together. The first 8 people to register will receive a complimentary copy of the book. It’s easy to get started! Just send me an email at lauraprisc@gmail.com or call me at 304-916-0348 to register and save your space in this life-changing study. Please, share this with your colleagues, relatives, and friends. Invite them to join you on your journey to success! I look forward to hearing from you. In the meantime, have an intentional day! Spend some time with your journal today, focusing on your beliefs and how they influence your ability to reach your potential. Consider both your beliefs in yourself and your beliefs about others. * Here are a few questions to get you started…then go where your thoughts take you! What influence do you think beliefs have on your potential? What do you think you need to believe about yourself in order to step fully into your potential? What resources do you believe you need to unlock your potential? How does what you believe about others influence their ability to reach their potential? What changes could you make in your beliefs that would allow you to soar higher? What changes could you make in your beliefs that might enable others to soar higher? A number of years ago, when more and more companies started getting more interested in and involved with Corporate Social Responsibility (CSR) and Environmental Stewardship, I was working as the Communications Manager for a food processing company. Having been in that position for several years, I had the communication duties well in hand and running smoothly. Looking for some new challenge to take on, I took it upon myself to become the company’s expert in CSR. To do that, I read all the relevant material, followed the relevant blogs, connected with the experts in the industry who were also studying the topic. I attended conferences and networked with others in the industry responsible for CSR within their respective organization. The CEO I worked for was pleased that I had taken this initiative, as he recognized the need to do something and didn’t have anyone else assigned to this role. I enjoyed it; it was interesting, I learned a lot, met a lot of bright people working in this area, and was able to guide the company’s position on CSR. The result was the inclusion of a number of key CSR-related initiatives built into the company’s next strategic plan. I don’t tell you this story as a way to pat myself on the back. I was looking for something new to focus on and the opportunity presented itself. The point is, there are likely a number of issues within any organization that need some attention, focus, and solutions. And, you could be the person to step up and take one or more of them on. What issue is there in your organization, right now, that no one seems to be dealing with? What possible solutions can you come up with to deal with it? What actions can you take to begin the process of moving towards a solution? How will the organization benefit from your taking the initiative in this area? The power or opportunity to act or take charge before others do. It is the drive to make things happen, and it is yet another crucial ingredient in the recipe for creating a strong leader. When leaders have initiative, they make things happen, they create momentum, and they propel their teams/organizations forward, even in the face of resistance and obstacles. Without initiative, one would achieve nothing. Yes, it’s important to have dreams, vision, strategies, action plans…yet, without taking the initiative, nothing would happen. I find this to be a fairly common stumbling block with some of my coaching and mentoring clients. They know they are stuck. They recognize the need for change. Sometimes, they even know what they need to change…but often feel helpless or unmotivated to take action. The key is to have clarity around the “why” so you then can find your “way” and take intentional action. Consider the story of Margo, a director in a high-tech company who was feeling somewhat discontent in her work and aware that it would be time for her to make some kind of move to a different position soon, as that was the culture within her company. We worked together for several months and over the course of that time, Margo chose to focus on several areas: improving communication with her team, improving communication with her manager, and understanding what next step she needed to take — within or outside the company — that would allow her to function in her strength zones, continue to grow as a leader, and express herself creatively. Throughout the course of our engagement, I functioned sometimes as a coach, sometimes as a mentor, and sometimes simply as a sounding board. Margo defined the areas of focus, identified the challenges and obstacles, discovered her own answers, and took action to make the changes she needed to make to move herself and her team forward. She took the initiative and she was consistent in implementing the new practices that would allow her to move forward. Today, she has a new sense of purpose, greater clarity around her role and future plans with her company, and has discovered a creative outlet that allows her to continue on her path of self-discovery and personal expression. It’s a process; getting to that point took a few months. Growing into her potential will be a life-long journey, but the point here is that she recognized some needs and took the initiative to learn, think, grow, and move herself — and as a result, her team and organization — forward on a new path. This month we will focus on initiative and how it plays out in our lives as leaders. It’s one thing to have an idea, it’s an entirely different thing to make it a reality. Without initiative, nothing would happen. Do I proactively take the initiative to get things started, or do I wait until circumstances force me to do something? If I wait for external forces to move me forward, what is the basis of my hesitation: Fear, lack of knowledge, laziness…? How have I overcome fear, lack of knowledge, laziness, etc…in the past to enable myself to move forward? How have I gained momentum by harnessing the power of taking initiative? Who do I know who frequently, proactively takes initiative to get things moving and what can I learn from them? I look forward to exploring this month’s topic with you, and hope you will share your thoughts, insights, and feedback as we continue on our Intentional Leadership journey.